New to meal planning? Learn how to meal plan with this step-by-step guide! These easy tips that are perfect for beginners and will walk you through creating a menu for the week. Meal planning is an simple way for busy families to save money! What do you have planned for the upcoming week? Are there certain nights that are busier with school, sports, or other activities? When you create your meal plan, you’ll want to keep in mind what you have going on during the week. If you know you’ll be late from work one particular day, that would be a great day to stick with an easier meal. If you have weekends free, you can use the extra time to prepare a more complicated meal. Do you have anything half-used in the fridge or pantry? Or maybe you have something approaching expiration like a carton of eggs? These items are a great starting point for your weekly meal plan. Using up what you already have in the house will help keep those food costs lower too! One easy way to figure out meals for the week is to come up with themes that recur on a particular day. You can create meal plan themes by how it’s prepared such crockpot meals, stir-fry meals, instant pot, casserole, or freezer meals. Ethnic themes are another easy way to think of meals for your menu plan: Italian, Asian, Mexican, American, etc. You can also plan your meals based around a particular protein each night like beef, seafood, vegetarian, or chicken. You can mix and match these meal plan theme ideas to create your personalized plan for the week! Want to meal plan but don’t want to be locked into the same meals each week? Consider trying a new cooking method like crockpot recipes or instant pot recipes. Mix up the weekly routine by trying a new recipe each week. If it’s a winner, then you can add it into the rotation for next time! Considering your themes, decide what meals you’d like to have for dinner in the upcoming week. For example, Mexican night could be tacos, chicken night could be stir-fry, and beef night could be hamburgers. Making sure to keep in mind any nights that you know you’ll have less time to cook, assign a meal to each day. As an alternative, you can just keep a list of meals to choose from for the week. I do this instead of assigning a meal to a specific day. I might know that we have breakfast for dinner, spaghetti, and hamburgers on our dinner list. Each night I choose from one of these options instead of deciding ahead of time. Sometimes our days or schedules do not go as planned. The main purpose of meal planning is to cut stress and save money. But if we opt for fast food or dinner out instead of our meal plan, any cost savings could be eliminated. Keep a couple of easy dinner meals on hand for when you’ve had an exhausting day at work and the last thing you feel like doing is spend time in the kitchen. This could mean something as simple as throwing a frozen pizza in the oven or any meal that is super easy to prepare. I like to use a printable to keep track of what meals are planned for the week. It’s a great way to figure out exactly what you need before you head out for groceries too! 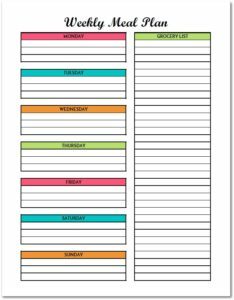 Get my free Weekly Meal Planning Printable here. Until you get used to planning your meals, stick to planning one week at a time. Don’t worry if one day you don’t stick to your plan, your back up plan will save you. Once you get used to planning your menus, you can increase how often you plan to two weeks of meals or even a month’s worth!